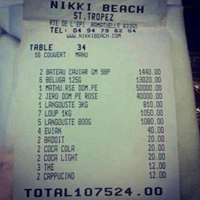 A new online genre that refers to blog posts of rich kids in various states of excess, including undress, indulgence, and photos of 100,000-euro meal receipts from St. Tropez for example. "The Rich Kids of Instagram" is a blog on Tumblr that debuted in August, 2012 and has touched off a firestorm of debate over rich kids and social media. One shot shows three teens swimming at a lake - and pouring Dom Perignon into one other's mouths. Another shows a guy sticking a giant foam finger out of his Ferrari, while in another kids slide down a giant inflatable slide attached to the side of their mega-yacht.